Nutone Broan® InVent™ 1-speed fan comes with one 100-Watt incandescent light. It has 4-Inch horizontal duct connector for quiet operation. This fan has white, 26-gauge galvanized steel housing for corrosion resistance. It has voltage rating of 120-Volt AC and current rating of 1.2-Amps. It has power rating of 42.3-Watts at 0.1-Inch static pressure. 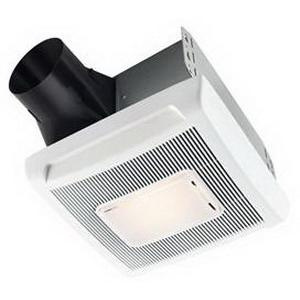 Fan has airflow of 70 CFM at 0.1-Inch static pressure and 60 CFM at 0.25-Inch static pressure to quickly reduce humidity to prevent or eliminate fogged mirrors. It has sound level of 2 Sones. Ceiling mountable fan has white polymeric grille that measures 11-7/16-Inch x 12-1/8-Inch. TrueSeal™ damper technology minimizes air leakage. Dynamically balanced centrifugal blower wheel provides quiet, efficient performance. Fan is UL listed and CSA certified.